I think I’m beginning to actually believe that Spring might make an appearance this year. January-February dragged on so long, with such continual poundings of snow on snow–I’m not sure it would have been bearable if the Olympics hadn’t arrived to distract–that it’s almost unbelievable that it could be warm and sunny and cheerful outside again. Granted, this being NE Ohio, it is still perfectly possible that we could see snow again in the next two months, but I’m holding out hope that the worst is past. After all, the crocus are spreading their cheer throughout the neighborhood. When I was out on some errands yesterday (how wonderful to be out without gloves or coat! ), I made a brief stop at Borders and while there started browsing the knitting magazines. 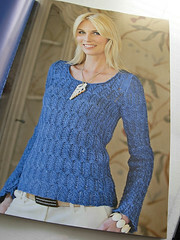 They happened to have a British magazine that I had only heard of in the last few months, on Ravelry, The Knitter. Several months back I was half-following the progress of a dedicated group of knitters who had decided to recreate an antique Shetland Shawl pattern and make it available to other knitters. The result of their labors is The Queen Susan Shawl. Their story is shared in Issue 15 of The Knitter, which is what first drew my interest to the magazine. However, I was pleasantly surprised by the number of pretty patterns I found inside. Being a British import, the magazine itself was on the pricey side, but between the number of patterns I’m actually interested in (as compared to recent issues of IK), and the quality of the layout–not only is it pleasingly arranged, with a photo index of all patterns at the front of the magazine, but the paper is also a nice heavy weight, which I feel sure will hold up to much knitting–I don’t feel cheated of my money. However, looking around past issues on Ravelry, I’m not sure every issue would be as exiting to me. I’m just happy I stumbled upon this one! 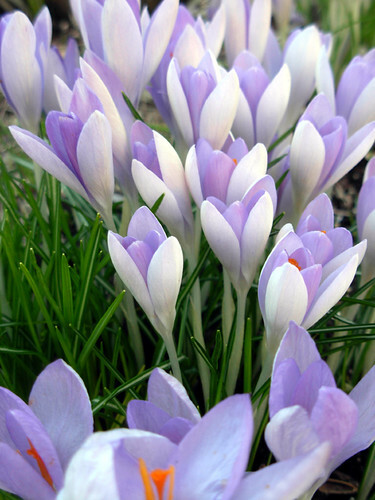 Mmm…crocuses! I love seeing their cheerful little faces in the springtime! Good find on the magazine, too. It’s great to find the occasional “super issue” that grabs you.